Kids of all ages LOVE the Aquatic Center's Zorbing Ball! Aquatic Centers Indoor Pool Open All Year! Credit Card payments can be made in the Utilities Department at City Hall at 915 N. First St.
for Bloomfield and the surrounding communities. 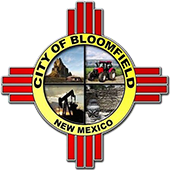 The Bloomfield Family Aquatic Center is currently operating on a reduced schedule and reduced services with a reduced budget. When the sales tax increases and the budget increases we hope to increase hours and services. EVERY WEDNESDAY IS WACKY WEDNESDAY ! Take advantage of the Four Seasons Annual Membership , which includes Fitness Center (including day use lockers & showers), Gymnasium, Racquetball Court and the Aquatic Center. This one year contract allows you to receive reduced rates; you will be responsible for the contract fee. Visit the Fitness Center page for more information. Learn about dates and classes of swimming lessons.